Looking at the first ensemble picture from Suicide Squad released earlier today, one of my main critiques was the fact that Will Smith's Deadshot wasn't wearing any kind of mask. Well, it seems that director David Ayer was thinking ahead on this one, because now he has revealed the character's full costume - mask and all. What makes this only more impressive is the fact that they went with the full mask. Certain interactions of the character have an opening over the mouth, and others settle with just a high-tech eyepatch (I’m look at you, Arrow), but Suicide Squad is going full-blown comic book. This up-close image also gives us a much better look at the heat that the movie version of Deadshot is carrying – and there’s a lot of it. It’s true that the giant, beautiful sniper rifle takes a lot of attention, but you’ll also notice that this is a version outfitted with the trademark wrist launches. He also appears to have two pistols around his waist – and who knows what he’s hiding behind his back. This might be me sounding selfish, but I wonder if this will be the last special and solo character shot we see from David Ayer. It’s kind of unfair to give us this fantastic view of the new Deadshot and then not provide spotlight moments for Margot Robbie’s Harley Quinn, Adawale Akinnuoye-Agbaje’s Killer Croc, Karen Fukuhara’s Katana and Cara Delevingne’s Enchantress (all of whom look awesome). 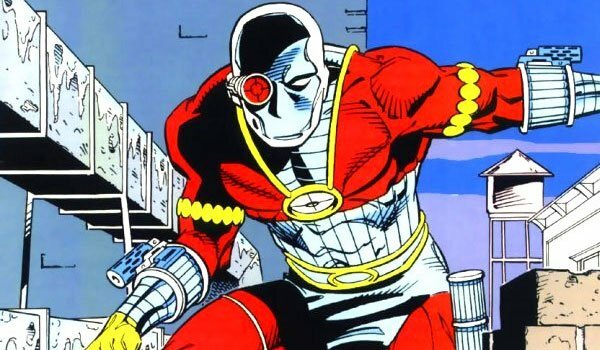 Do you approve of this Deadshot costume? Are you as curious as I am to find out what the message around his neck means? (I can make out "The Light, The Wo…") Do you also find it interesting that they put the targeting system on the right eye instead of the left? Hit the comments with your thoughts! Suicide Squad will be in theaters on August 5. 2016.